All items in the library have been catalogued, and a comprehensive Library Catalogue Search facility is available. If you find any item in the library that you would like to be brought to a members' meeting, to view or to borrow, then please write a short email to the Secretary, and it will be arranged. Our original reference materials may only be accessed at our meetings, but the item may also be among the Indexes held by members. Items such as local history books, and textbooks may be borrowed by members for a month, between meetings, or by arrangement with the Librarians. Our considerable collection of printed exchange journals may also be borrowed between meetings. 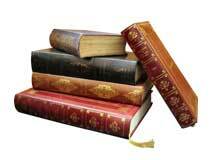 They form part of our bookstall, and may be borrowed by arrangement with the Bookstall Manager. Accessions to the library are partly from purchases and partly from donations by members. All items will be considered for inclusion, so long as they relate to the West Middlesex area and/or are likely to benefit family historians. Members are encouraged to make recommendations for new acquisitions, either to the Executive Committee or to the Librarians. Members are reminded that all the Memorial Inscriptions documents produced since 2012 can be viewed as PDF files from the Digital Library page.